Neroli oil is a plant oil similar to bergamot produced from the blossom of the bitter orange tree. The oil is produced by water distillation, as the blossom is too fragile to endure steam distillation. By the end of the 16th century, Anne Marie Orsini, duchess of Bracciano and princess of Nerola, introduced the essence of the bitter orange tree as a fashionable fragrance by using it to perfume her gloves and her bath. Since then, the name of Neroli has been used to describe this essence. Neroli has a refreshing and distinctive, spicy aroma and is described as a sweet, bitter, floral citrus top-middle note. Neroli oil is a classic element in fragrance design and one of the most commonly used in the industry. The oil is also edible. The active constituents of neroli include: terpenes such as linalool and flavonoids such as naringin. Neroli can be used on all skin types, but is best for blemished, mature, normal-combination and especially sensitive skin. Its antimicrobial properties are preservative. It is good for the following skin conditions: dehydration, cellulite, stretch marks and sensitivity. 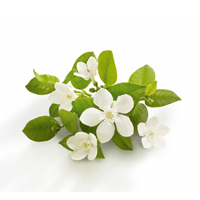 Neroli is balancing, soothing, warming and energizing to the soul as well as the skin. Used in aromatherapy and massage, it is considered to have a soothing effect on the nervous system and is considered to be a sedative for emotional shock or grief while also uplifting and stimulating the heart chakra. Emotional benefits include ease of: anxiety, depression, grief, hysteria, nervousness, panic, shock, shyness and tension. Niacinamide (also known as vitamin B3) belongs to the family of the B vitamins. As a water-soluble vitamin, Niacinamide helps improve the skin's moisture barrier and softness - and this helps allow for the natural production of collagen. It also improves the appearance of ageing skin by strengthening the stratum corneum (outermost layer of the skin) and increases the rate of skin surface renewal to help reverse the appearance of past damage such as discoloration or the look of enlarged pores. Niacinamide helps impart a more even-looking skin tone by inhibiting the appearance of hyperpigmentation from extended exposure to sun light.